Inhibit X® is a single component, low-viscosity liquid that provides an added measure of protection against cure inhibition when pouring platinum silicone rubbers over many surfaces including sulfur clay, instant adhesives, tapes, wood surfaces, some plastics, SLA resins and others. Recommended: to ensure surface compatibility, conduct a small-scale test on a similar surface before using on a valuable model. This product has a limited shelf life and should be used as soon as possible. Apply at least two coats of Inhibit X® - Using a soft brush, apply a thorough coating over all surfaces that will contact rubber, including into intricate detail, and let dry. Follow with another application and let dry. Follow with an application of Ease Release® 200. If applying by Inhibit X® with non-aerosol pump spray - apply a light mist coating to all surfaces that will contact rubber, brush over all surface areas and let dry. Follow with second light mist coating. Follow with an application of Ease Release® 200. Platinum silicones are especially sensitive to sulfur-bearing clays and tin-cured silicones. Apply 3 coatings of Inhibit X® prior to applying release agent. 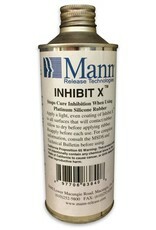 Important: In many cases, Inhibit X® may act as an adhesive and bond platinum silicone. After applying Inhibit X® to a surface, let final coat dry and apply a light mist coating of Ease Release® 200 Release Agent (available from Smooth-On and Smooth-On Distributors). Ease Release® 200 is a release agent formulated for use with tin and platinum catalyzed silicone rubbers. Warning: This product is flammable. Exercise extreme caution and follow safety protocol for handling flammable liquids. Refer to MSDS for further safety information.